“Picture By: dunno source” is how my stolen photograph is attributed at the ICanHasCheezeburger website, one of the most popular sites on the Internet. At my Flickr photostream it is “© All rights reserved” to me. My “Good Cat – Bad Cat” copyrighted photograph has been illegally uploaded to the I Can Has Cheezburger site, credited as “Picture By: dunno source.” As of today, 26 December 2008, fifty-nine (59) derivatives (Lolz) have been made of this photograph, totally without my permission. My original photograph that I published on 5 August 2006 is here: Good Cat, Bad Cat by Edna Barney. ICanHasCheezBurger is on Flickr, profiled at www.flickr.com/people/icanhascheezburger. Here is the commercial website’s cat group on Flickr: Flickr Can Has Cheezburger. Does anyone else know of any other “commercial” websites who are allowed to have groups on Flickr? I could not find any, other than ICANHASCHEEZBURGER. The image, Dunno Source, is subject to copyright by barneykin. It is posted here with permission via the Flickr API by barneykin. I had visited the ICANHASCHEEZBURGER site only a couple times after learning that my “Good Cat, Bad Cat” copyrighted photography was there without my permission, when I spotted an Abyssinian cat I recognized from Flickr. It is a very popular photograph at Flickr and since I own an Abby cat, I recognized it immediately. ICANHASCHEEZBURGER credited it to “dunno source.” I doubted that the source of such a popular picture could be unknown. At ICANHASCHEEZBURGER the cat poster was made into a template named “I Am Goddess,” contributed by Ozzy Kat and camcat. I found what appeared to be the original photograph at Flickr, “(c) All Rights Reserved,”named “Belle on Black 4.” After I contacted the Flickr photographer about his non-credited photograph at ICANHASCHEEZBURGER, I noticed that the site changed “dunno source” to his name. However, at their LOLcat Builder page, his picture is still credited as “Picture By: dunno source”and there are seventy-five (75 and counting) derivative images of it. I found that not one credited the Flickr photographer of such a popular ICANHASCHEEZBURGER template. 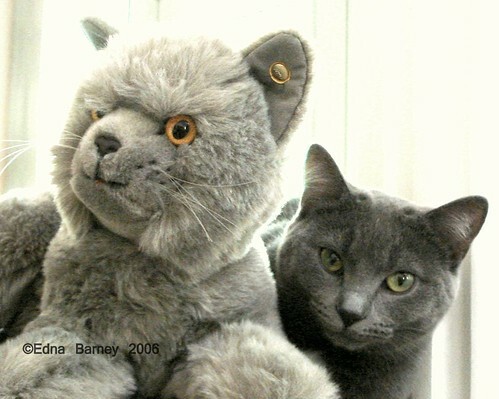 On 5 August 2006, I uploaded this photograph of my pet, Katy Blue and my stuffed Stieff cat to the Flickr site. It has always been prominently labeled as “copyright,” although I added the written notice on the actual photograph today, after realizing my copyright had been infringed. That copyright notice did not stop the ICanHasCheezburger.com site from infringing my photograph and posting it at their site for their own commercial purposes. On 21 December, when another Flickr user reported to me that my photograph was posted at their site, ICanHasCheezburger.com added my Flickr name as credit to the picture. Then they wrote to tell me how proud I should be that my photograph is on the front of their site. When I told them, as the owner, to remove my photograph, because I had never given them license to use it, they blatently refused until I provide written legal proof that I am the owner of the photograph. This they demanded, even though they had already admitted in writing that the photograph belonged to me. So, beware, if you upload your photographs to Flickr and allow said photographs to be publicly viewed. ICanHasCheezburger.com is a Flickr member, with Flickr groups, and seemingly has little regard that you label you images as copyrighted. Yahoo.com owns Flickr, and I have written Yahoo about this matter. If I hear from them, I will report here their actions on this matter. It is already the case, that Flickr members like ICanHasCheezburger.com are allowed to operate on Flickr even though they are commercial sites, which Flickr Terms of Service forbid. The image, Good Cat, Bad Cat, is copyright by Edna Barney posted here with permission via the Flickr API by barneykin. http://www.icanhascheezburger.com was founded in January 2007 as a place to collect “LOLcats”—pictures of cats with funny captions. It has gone on to become a singular sensation, captivating millions and becoming one of the most visited blogs on the internet. For the book, the founders of the site have selected 200 of their favorite LOLcats from their archive of nearly one million, all of which are guaranteed to make you laugh out loud or wonder WTF? Surely John Adams Is Repenting in Heaven For the Sheep Who Are His Posterity. Although it is sad to contemplate, it is the reality of today’s America, as more and more traditional Americans of faith, conservatives, small business owners, the military, are feeling disenfranchised from their own country and their government. I am one of them. How can any American of old-fashioned honesty and character continue to believe in a government that is so blatantly corrupt? How can Americans trust greedy leaders who tax them to redistribute their hard earned money as rewards to other greedy politicians and overpaid and corrupt business executives? We have only to examine Congress’s own businesses, Fannie Mae and Freddie Mac, that were plundered by that same Congress and their favored friends, resulting in the near collapse of the nation’s banking system. This is even before we ponder the now commonplace scenario of tenaciously clutching onto so-called elected positions until death do they depart, only to bequeath those seats in Congress to family members as though they were a part of an anointed Solon’s estate. Now we are discovering that in the former land of Lincoln, a United States Senate seat is offered to the highest bidder. The church I have belonged to all of my life is being attacked and its members persecuted by my fellow countrymen and America’s vetted churches of Christendom. My traditional beliefs that were taught me long ago by my family, teachers and church are now lampooned by Americans of today who know little of America’s history. We are now described as uneducated and full of hate by “in favor” American Christians, when we are not being ridiculed. I have been publicly told by the now President-elect of the United States that the American flag I once proudly displayed at my home and wore on my clothing, was merely a sign of my own “false patriotism.” I have never felt a racist thought against anyone, and have lived closely with people of many different races including African Americans. However, for the first time in my long life, in 2008, I was repeatedly labelled a racist because I, a conservative, did not support a liberal black man as candidate for President of the U.S. At the same time, those very same Americans who labeled John McCain supporters as racists, now condemn the founders of this country because those who volunteered in 1776, to sacrifice their own blood, sweat and tears for our freedom, were rich white males. We, the disenfranchised Americans, were taught that our vote was sacred; that it had been won for us with the blood of patriots. How can we continue to believe that when we see with our own eyes federally-funded groups such as A.C.O.R.N run ads on television against our preferred conservative candidate? Why would we continue going to the polls when we know that these same federally-sanctioned community organizations will be stealing our votes, with our own tax money, by overwhelming them with dozens or hundreds of ill-gotten illegal votes? How can our “one” vote stand up against the onslaught of criminality encouraged by our own government’s elected officials? Just today, two weeks before our Christian holiday of Jesus’ birth, the Alaskan church of Sarah Palin was struck by arsonists. The smoke alarms of the church saved the lives of the women and children working inside, from evil would be murderers of innocent “out of favor” Christians. (Anchorage, Alaska) Governor Palin’s Church is one of those conservative churches that is now reviled by much of America, the media, late night comics and mainstream Protestantism. Her church believes in the same traditional Christian tenets that the Pilgrims and Puritans brought to this land; tenets which come from the Holy Bible. However, these disenfranchised Americans who are being deprived of their Constitutional rights, are still expected to swear oaths supporting the Constitution that is not supporting them, to pay taxes which are then used in schemes to further bludgeon them, to send their children to schools to be indoctrinated to revile their own parents’ beliefs and culture, and to continue to raise their young people to believe it patriotic to fight America’s wars, although America will never fight for any of the reviled, out-of-favor, and disenfranchised ones. Mainstream America, secular and progressive America, finds that fair and just, as they tell us that we are disenfranchised from their “changed” America because we are worse than Hitler and more frightening than Osama bin Laden and all of Al Qaeda put together. The Chicago Machine is coming to town! The Chicago Machine is coming to Washington! Why, you ask? Because the voters voted for them to come. The voters voted to CHANGE Washington. Here comes “change” you can believe in; “change” you can see, the “change” you’ve been wanting all the days of your lives. The image, Obama Christmas Angel, is subject to copyright by Chantal Bennett & A Winsome Portrait. It is posted here with permission via the Flickr API by barneykin. In Barack Obama’s first memoir, “Dreams from My Father,” the author discussed his unusual childhood, his Kenyan African father, his white mother, his grandparents in Hawaii and his life in Indonesia. He also covered the three years in the 1980s when he worked as a community organizer in Chicago, Illinois. In Obama’s second memoir, “The Audacity of Hope,” he covered the Senate campaign that he waged to win election to the United States Senate, and the more than one year he served as a newly elected Senator between 4 January 2005, until 2006. Chicago is Obama’s political home town; it is where he forged his political identity. However, Obama’s life in Chicago from 1991 until his Senate victory in 2005, was mysteriously overlooked or ignored in both autobiographies. What was Barack Obama accomplishing politically during those missing years in America’s center of vicious and corrupt politics, … Chicago? America does not know because most American voters were uninterested in Obama’s history. Those who did seek information about Obama’s relationship to Chicago’s political machine, were called racists for questioning the character of a black man. During the Presidential campaign, the American media were uninterested in performing investigative journalism of Obama’s Chicago years, even while a federal prosecutor and his federal office were abroad in the city doing their own investigative research. The missing years of Obama’s life in Chicago seem now on the cusp of revelation. They will be revealed by the court documents of federal prosecutor Patrick Fitzgerald. Those lost Obama years will be documented by Obama’s Chicago friends, associates and enemies such as former U. S. Representative and now Illinois Governor Rod Blagojevich, Mrs. “I saw a man he danced with his wife” Blagojevich, the Illinois governor’s chief-of-staff John Harris, Congressman Jesse Jackson Jr., Reverend Jesse Jackson Sr., bagman Tony Rezko and his “Realtor” wife, current U.S. Congressman Rahm Emanuel who is also working a second job as Oama’s Chief of Staff, Obama’s chief strategist and Daly Machine mouthpiece David Axelrod, David Wilhelm, and assorted other characters of Chicago’s inner sanctum machine. Rahm Emanuel, a congressman from Chicago and a friend of Obama’s, told me that he, Obama, David Wilhelm, who was Blagojevich’s campaign co-chair, and another Blagojevich aide were the top strategists of Blagojevich’s victory. He and Obama “participated in a small group that met weekly when Rod was running for governor,” Emanuel said. “We basically laid out the general election, Barack and I and these two.” A spokesman for Blagojevich confirmed Emanuel’s account, although David Wilhelm, who now works for Obama, said that Emanuel had overstated Obama’s role. Perhaps right this moment, Rod Blagojevich himself may be writing the screenplay to “Chicago Boyz,” as I jokingly speculated HERE and HERE. To a White House Near You! The voters asked, and Chicago listened. America cannot wait for the change promised by Chicago’s Top Boy, Barack Obama. The brand new musical “Chicago Boyz” is destined to take the White House by storm. Politics in that once Southern town of Washington DC is about to experience “radical” change. It’s “Chicago Boyz” starring President-elect Barack Obama, his dancing Chief-of-Staff, Rahm Emanuel and the rest of the gang of side steppers. This is NOT New York City; this is NOT “The Sopranos,” implies “The New Yorker.” And, this is NOT beanbag! It is Chicago Boyz’s own political machine come to Washington – to stay and play, and to “Pay to Play!” It’s the Chicago Boyz Way! Office of the President-Elect, originally uploaded by Jules°. You are currently browsing the Kerfuffles and Flourishes blog archives for December, 2008.